► We have peace of mind! Bob and I were out one evening and had just had new carpet installed in our condo and we got home about 10-10:30 maybe and we walked in and went in the hallway and here was all this debris, all I can say is black guck all over the carpet. And it was like, “My God what happened?”. And we opened it up and sure enough it was coming out of the pipe of the air conditioner. And what did we do? Of course we called Home-Tech. And by 11:00 or quarter past eleven a workman was here. Cleaned up, made sure everything was ok, took care of the whole situation. What more could you ask for – coming that late in the evening? If we didn’t have the coverage, I being not a very handy person with all the stuff, we would have many problems. I would have to be sure that someone would be here and Home-Tech, as far as I’m concerned, takes away the plumbing, the electrical - the things that I have no knowledge of and don’t care to have any knowledge of, to tell you the truth. Within a few months after signing my contract and sending it in, low and behold my air conditioner went out so I called Home-Tech right way. They came immediately. The service was amazing – everything was handled beautifully and I was just so appreciative. Of course now I tell everyone I know – sign the best contract that you can get. Go with Home-Tech. That’s who you need. 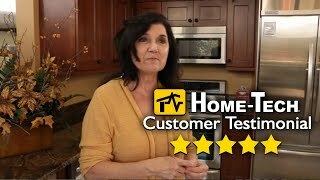 They are absolutely the best company for all of your home appliances and all the service work that you need done to make sure things are done the right way professionally and done in a way that they treat you with great respect. We’ve been with Home-Tech for about a year and when we first bought the warranty we just thought well you know things happen, but at least we have peace of mind knowing that if something happens, we’re going to be covered, never dreaming that we were going to have our refrigerator, our oven, our dishwasher, our garbage disposal replaced, our hot water replaced and the air conditioning system – most parts replaced already. Ah the Home-Tech value for us has been priceless, just absolutely priceless. I almost feel guilty calling because we’ve used it so many times. But they assure us that that’s what the warranty is for so it’s been a real blessing for us. That’s for sure. Your guys came in and first of all we went through the project. They came up with a plan. They executed the plan and the install was absolutely gorgeous. Which to me, as an engineer, shows me that the guys that did this actually had a lot of pride in their work and it was fabulous. It looked great when it was finished. I actually had 3 other bids and actually your bid was the best air conditioner for the best price. 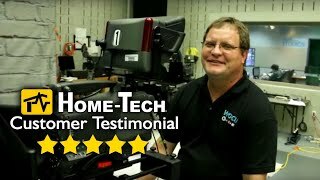 I think you should hire Home-Tech because sincerely they are professionals. They do a great job. They are going to find exactly what you need and provide that for you and not to try to sell you something more than what you need. And when they were done it was just like it’s done. I turned it on, we got cold air out of the vents and it worked great. It’s still working great. Having been a Home-Tech Service Agreement member for approximately 8 years I am really extremely satisfied to the point that now I’m purchasing all of my appliances in the showroom. And no matter what’s out there in the “ads”, we don’t need an ad. The Home-Tech experience is a total experience. It’s not just a technician in your home which is in the field but it’s also the way you feel when you come into the showroom because there is an employee that walks up and greets you too. Because I can wander around other big service centers and they don’t have an employee. Maybe it’s because I look like I’m taking my mother with me and they’ll ignore those two. Well if I’m going to buy the package, and I’m buying a high end package, I, you know, it would be nice to be treated nice. This works for me. I want to come and get taken care of. I know you will take care of me. I’m not looking anywhere else. So this is one of the few stores in Florida that I know will take care of me. And I mean it. 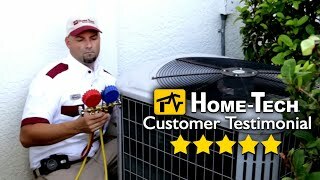 We’ve had 3 air conditioners replaced with Home-Tech and they were fantastic to work with. Not only are their prices extremely competitive but also they were very accommodating. As far as the install it was flawless. We didn’t even know that they were here. It was quiet. They were totally accommodating to our needs of having to be in and out of the home and in and out of some of the spaces they were working in. Our dog was sometimes in the way and they were just great. We didn’t even know they were here. They had laid tarps so that nothing was disturbed. There wasn’t even any dust anywhere. Our house was in perfect shape when we came home. 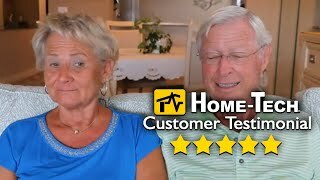 I’m always so happy to recommend Home-Tech when someone asks for an opinion for so many reasons. First of all for how involved in the community Home-Tech is. That’s extremely important to myself and my family as well as many of my friends. So that really excites us that this is a company that re-invests and gives back to our community coupled with the amazing customer service that you receive, the excellent value, competitive pricing and speed and accuracy. 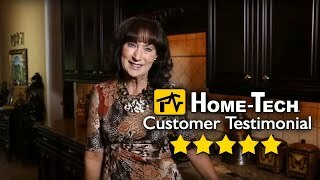 So I love recommending Home-Tech. As well I know my friends are going to be equally if not more happy and it makes me look good. So the overall experience was just wonderful. Again, I rarely write positive notes as I did via email with Home-Tech. I’ve never done that before and come to an actual video-taping for sure. That’s new to me. I’ve never done that. And considering I train people in customer service this is the highest compliment that I can pay anybody. 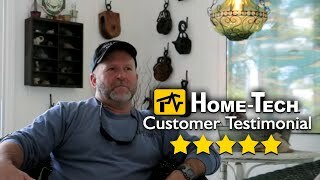 So I would highly recommend anybody that is looking for the finest service with nice people, because that to me is just as important as the service, clearly consider Home-Tech. I wouldn’t go anywhere else. And my wife was home at the time, because she’s in a wheel chair and works out of the home as I do so she interacted with them as well. They were able to allow us to go on and carry on our day. They were neat and neatness is important to Kim especially. But we appreciated how they did during the service and also afterwards with clean up. In addition to that, if I may, they were considerate. We have a dog who we love as our only child so to speak and she lost her eye sight a few years ago. And so when anyone comes into the house we’re very aware of how they treat KC, our child. And they were wonderful with her and they didn’t step on her or have to say anything at all negative because sometimes she loses her balance and where she is in her environment. So they were terrific that way. And they were knowledgeable, so that’s the complete package. They knew what they were doing. They got to it, fixed it. Well these guys were terrific. 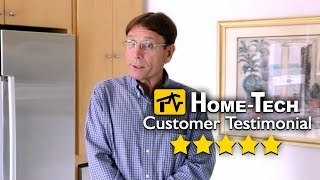 Very, very friendly – that’s what I find about Home-Tech people. They do not mind coming out if they are on call. We had an experience with another air conditioning company and he used to come out sometimes on a Sunday and when he arrived at the door his face was down to his knees. Cause you knew he didn’t want to be here. And it was very, very uncomfortable. And it was because of that experience that we decided to change over to Home-Tech with our air conditioning because we have everything else with Home-Tech. And we have not been at all sorry. We absolutely love the service. It’s just a complete service from the phone call to the fixing of whatever you have them fixing. It gives us peace of mind. That’s what I really think I feel . . .peace of mind. Because I know when I call them I’m not going to have a bit of problem. It’ll get fixed. That’s all we care about. I live out in Bokeelia and you know a lot of times we call people and we get, “Oh I don’t go out there.” Or “I don’t go to the islands.” So I’ve seen Home-Tech vans out here before so I sent them an email this morning at 0:6:30. By 7:20 somebody was calling me and arranging for an appliance technician to come out at approximately 11 to noon. And he sure was. He was prompt and he came in looking good, professional, you know, clean and ready to go. I’m a fisherman. I’m a paramedic and you know I can work on my truck. Heck, I was in the Navy. I could work on a F-18. But me trying to work on my refrigerator, diagnose, find the part, do all that – that’s like trying to reinvent the wheel. It’s easier and more economical if I call somebody I can rely on that will come and do it. It was fast. It was convenient. The guy came in when he said he was going to be here. He was in and out. You know, I can’t say enough. Comments may be used for promotional purposes.